Cattle Pump System [CPS] : Highland Livestock Supply, Ltd, Products for all of your show animals! 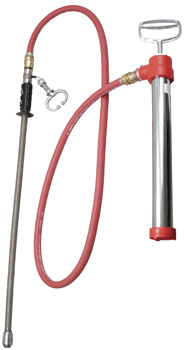 The pump system you need for the proper fill in show cattle. Stainless flexible probe with tear-drop end ensures placement into the esophagus. Has nose lead and hand grip. Canvas carrying case.